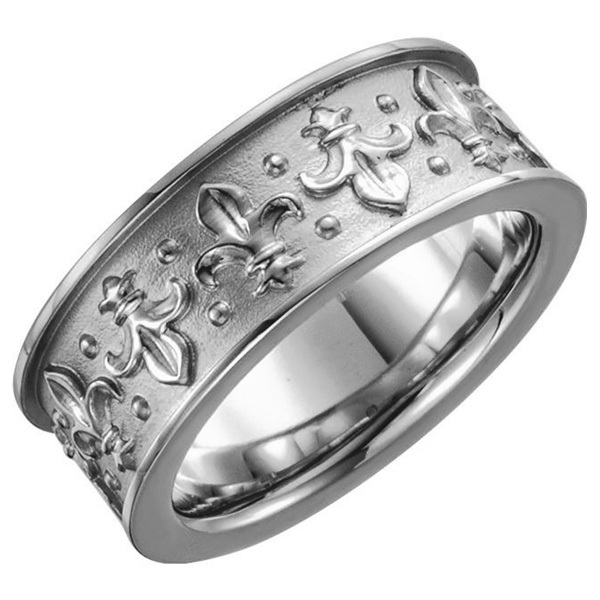 The beautiful Fluer-de-Lis design makes an appearance on this beautiful Fluer-de-Lis wedding band ring in 14K white gold from Apples of Gold Jewelry. The 14K white gold band has a textured design, compete with a recessed appearance. The center of the band features a continuous Fluer-de-Lis design, which is popularly associated with The Song of Solomon, makes its way around the entire band, which measures 7.75mm in width. This stunning ring makes a lovely wedding band, whether paired with an engagement ring or worn alone. We guarantee our Fluer-de-Lis Wedding Band Ring in 14K White Gold to be high quality, authentic jewelry, as described above.